A dry red or white wine has about 125 calories and 4g carbohydrates per 5oz glass. During the process of fermentation, sugars from wine grapes are broken down and converted by yeast into alcohol so it ends up surprisingly low in sugar. Wine is a good choice if you want something to sip on slowly or to pair with a meal at a dinner party. It is pretty low in sugars and carbohydrate, but best to keep it at 1-2 glasses. Beer can vary depending on the kind. On average, a 12oz beer contains about 150 calories and 7-12g carbs. Some of the lighter varieties can be closer to 100 calories and about 5g carbs. If drinking beer I recommend no more than 2 of the light variety such as Coors Light, or stick to one stronger flavored dark beer that you can take your time to enjoy. 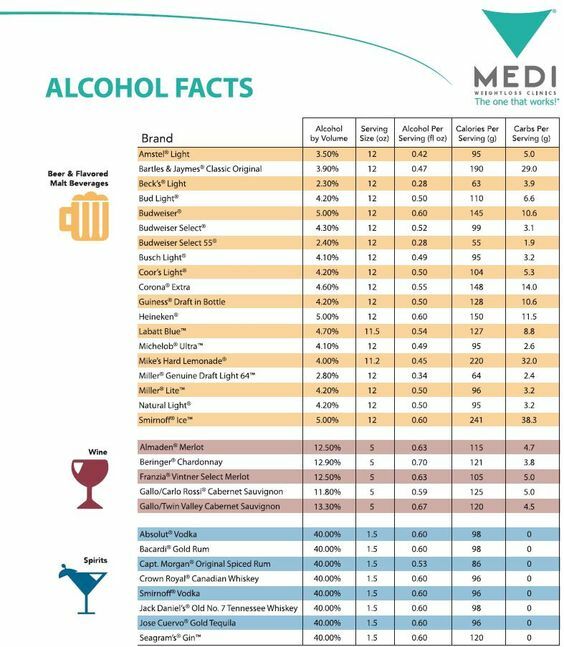 A 1.5oz shot of most distilled liquor (vodka, rum, gin, tequila, whiskey, etc) contains about 100 calories and 0 grams of carbohydrate. This is probably the best choice in terms of keeping carbohydrates low. Here’s the kicker though: most mixers and juices tackle on hundreds of calories and a ton of sugar and carbohydrates. The only way hard alcohol is a decent option is if it is taken as a shot or mixed with a low or calorie-free mixer, diet soda, or club soda. Tonic water is NOT a good option, although it sounds healthy it is actually loaded with sugar. An easy go to: I suggest using fresh lemon, lime, grapefruit, or a combination of all three with the liquor of your choice, then topping off with club soda or fresca for sweetness (a calorie free citrus flavored soda). -Remember: even lemon or lime has calories and carbs. So if you are counting carbs, count on the juice of one lemon or lime adding about 10 calories and 3g carbs to your drink count. If you add 1/4 grapefruit (perfect amount for a drink) add 25 calories and 6 carbs. –WHATEVER you decide to drink, please do it responsibly! Just like anything else, moderation is key!! Fill glass with ice and set aside. Stir all ingredients together until the agave nectar dissolves. Pour over ice and enjoy! Here is another low calorie margarita recipe, this one sugar free and about 1g carbs. Muddle vodka, mint and blueberries together in a shaker. Add one cup of crushed ice and shake. Pour into a cocktail glass and top with Sprite Zero, garnish with remaining mint & blueberries. Put the ingredients in a cocktail shaker half-full of ice. Shake well. Strain into a glass. Each serving has 3 grams net carbs and 106 calories. Pour ice in glass. Add frozen berries. Pour wine, then sparkling water. Sip and enjoy.